Thank you Croosade team for the update! Have been waiting for the new cash items. And praying that there will be new hairs and faces added to beauty parlors (highly unlikely but I am praying for it anyway). Edit: Just noticed that the cash items are only available through surprise box and it only lasts for a month. My feelings are scammed! Nothing to fix. For 500 nx 30 days is totally fine. The credit shop has been updated with new options. 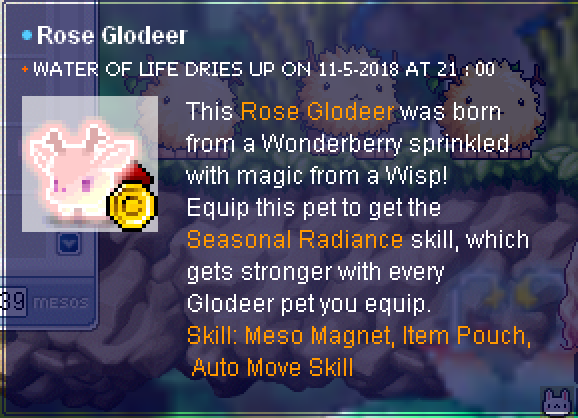 What do the skills "Meso Magnet, Item Pouch, Auto Move Skill" mean? That the pet has these skills and dont require the respective pet equipment? And do pets from @credits die? Updated the original post " Ignore the descriptions. Pet's do not have built-in meso magnet, item pouch, etc. " If their life dries up, you can revive them using the water of life in the cash shop.